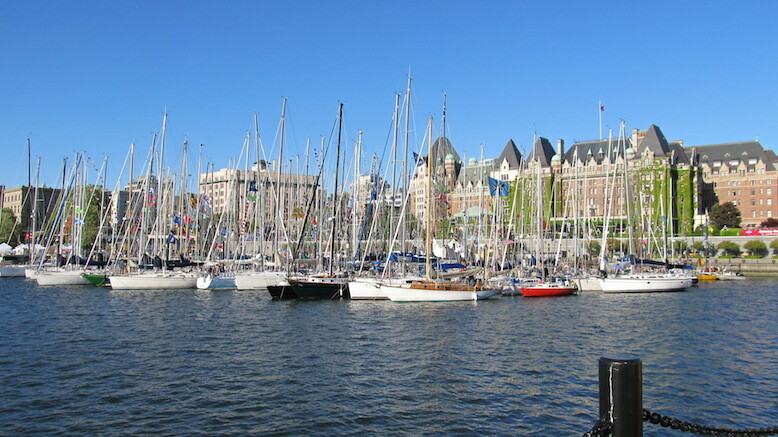 Since January 2015, the Royal Victoria Yacht Club has been accepting applications for the 72nd running of the Swiftsure International Yacht Race, which goes from May 23 to 25. In the first running of this iconic event back in 1930, just six boats participated. Last year saw nearly 200 boats, coming from as far away as Portland, Oregon, and in previous years from Hawaii and even Russia, to challenge the infamous winds and tides of the Pacific Northwest. 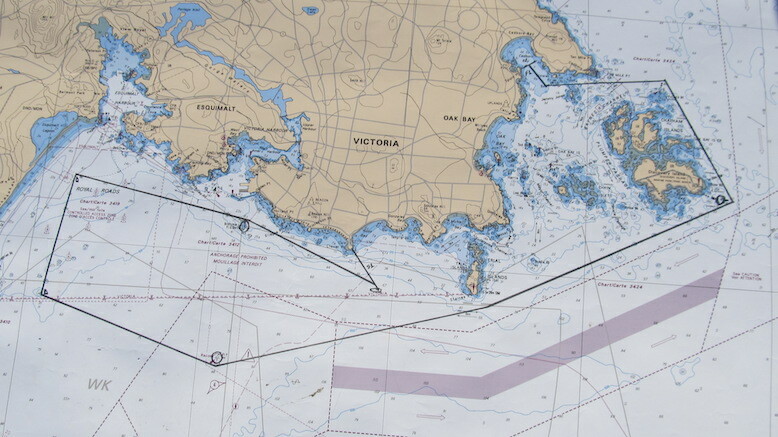 The premiere race is still the Lightship Classic, 138.7 nautical miles return from Victoria, BC to the Swiftsure Bank, just beyond the west entrance to the Juan de Fuca Strait. However, sailors can now choose between five different course options, including the Inshore Classic, a shorter race within the eastern end of the Strait. A few days before last year’s race, my friend Karen asked if I would like to participate in the 21-mile Inshore Classic race with her partner Jim and two friends, Tim and Paul. I first met Karen years ago when she participated on a cruise-and-learn I offered in the Gulf Islands. While I have cruised extensively, my racing experience was mostly on Sabots and Lasers on fresh water lakes. “Yes,” I said, “I would love to join you, but mostly as an observer,” explaining that I was recovering from a broken wrist. “That’s ok,” she said, “it’s mostly just for fun.” We would meet at Victoria’s Inner Harbour on Friday evening after the Skipper’s Meeting to walk the docks and ogle at some of the sleek machines rafted together, awaiting the next day’s start. Racing stories, camaraderie, and a festive atmosphere prevailed with flags flying from masts and happy hours underway in many cockpits. 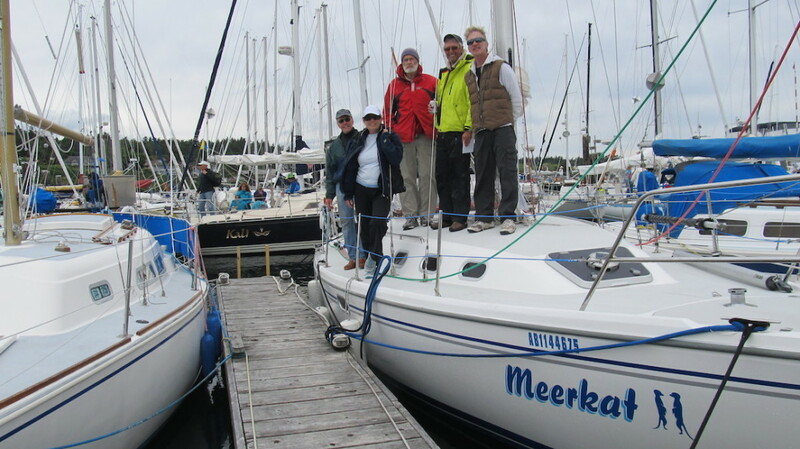 Meerkat, Karen and Jim’s 34’ Catalina, was docked at the Royal Victoria Yacht Club Marina in Cadboro Bay, the finish line for the Inshore racers. 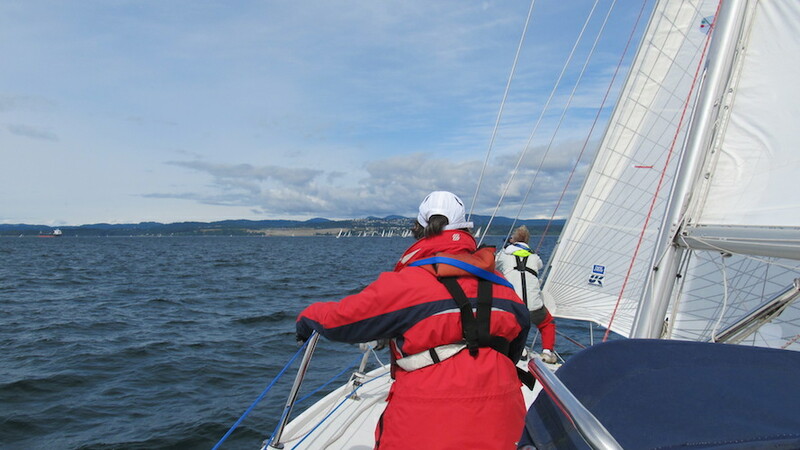 On Saturday morning an hour and a half before the race, we motored with an array of competitors, most between 30 and 40 feet, toward the start line, five miles south off Clover Point in Victoria. Conditions were perfect: a 15-knot breeze, sea rippled, sunny skies, and a favourable forecast. Of the five of us, only Karen had participated in this event, crewing on another boat. Along the way, I asked Jim about his expectations for the race, and he candidly admitted that they are “usually somewhere in the middle of the pack,” as they were in the Round Saltspring Race the previous week. Upon nearing the starting area for the race, we were awed with the spectacular sight of a sea full of boats sailing to and fro, each waiting for the starting gun that would set off a fleet in designated categories: the long-distance racers would depart at 9 am and the remaining fleets at 10-minute intervals. Ours would be the last to cross at 9:40. About a half-hour before our start time, we raised the main and unfurled the jib. It quickly became apparent that I did not have the strength in my wrist to efficiently operate the jib winch. Instead, my responsibility would be to trim the main. Tim handled the jib, Paul advised the helmsperson about intersecting boats and deployed the spinnaker, while Karen and Jim alternated at the helm during different phases of the race. This seems pretty simple, and it is in a dinghy regatta with a start line less than 30 metres across between two buoys. Not so in the Swiftsure: the start line stretched between a construction crane on shore and HMCS Nanaimo, a Canadian Navy frigate positioned southeast a half-mile off shore. During our 10 minutes since the previous fleet departed, we cautiously edged toward the Frigate concerned that we might prematurely cross the line. Not knowing exactly where the line was, we were relieved when the gun sounded. This relief turned to disappointment when we estimated that we crossed the start line 6 minutes later! In hindsight, we should have arrived at the frigate much earlier before the race and taken a bearing on the crane; then transferred that bearing onto our chart plotter so we would know exactly where the start line was in relation to our boat. Ideally, we should have crossed the line with a full head of steam immediately after the gun. It’s important to know in advance where the markers are, and the optimum courses to them. This is especially true for the first mark to windward, since the shortest distance to this mark determines the preferred side of the start line. In our race, it was the right side closest to shore (see chart showing Inshore Flying Sails course); unfortunately, we were on the left side furthest from shore. The coordinates of each mark and course lines were provided at the Skipper’s Meeting and Jim had diligently circled the marks on our paper chart. In addition, they and the course lines should have been recorded on our chart plotter for ready reference in relation to our boat. Our strategy for finding the marks was to follow the pack and scan the horizon with binoculars, which we did frequently. Knowing the course proved especially beneficial at the end of our downwind leg when we stopped following the pack and took the shortest route past Discovery Island. This “shortcut” got us ahead of a whole bunch of boats and all of a sudden, the race became much more interesting, as we were all recharged with the possibility of taking the lead even though several other boats were still ahead, approaching the finish line. In light winds, as they were during the latter half of the long race, sailors with keen observational skills and the ability to “read ripples,” have an advantage. But winds, regardless of intensity, are only part of the equation for a decent saltwater sail — currents play a major role. Juan de Fuca Strait floods from the west. As in most tidal channels, current is stronger in deeper water than it is along the shore, due to friction created when water contacts the shore. Since the current was against us when the gun sounded, we should have stayed closer to shore. Instead, we were further out in deeper water, sailing against a stronger current. On the next-to-last leg, a post-race review of currents showed some back eddies close to shore, which we could have avoided by staying further off shore. But who knew? We should have: a current graph was available to participants prior to the race (www.swiftsure.org/currents-during-race-2). The combined effect of wind and current on our third reaching leg created some significant and unexpected leeway. Our attempt to stay on the starboard lay line while close hauled required us to tack not once, but twice, to round the mark. On our second tack near the marker buoy, because of intersecting traffic with right-of-way, we were almost dead in the water. To account for leeway, we might have extended our second windward leg beyond the marker, allowing us to stay above the lay line in clean air and maintain speed with no additional tacks. Obviously, it’s a judgment call, depending on the strength of wind and current and the behavior of other boats, as to how far to sail past the marker to accommodate leeway on the next leg. At our level of experience, we might have had five different opinions, but the important thing is to be aware of and anticipate leeway. Knowing which boats have right-of-way is critical throughout the race but especially so when everyone is jockeying for position at the start line. According to the ISAF Racing Rules of Sailing (http://www.sailing.org/documents/racing-rules.php), boats on starboard tack have right-of-way over those on port tack. Obviously then, crossing the start line on a starboard tack is preferable, provided it is the shortest distance to the upwind mark. We crossed on a port tack and had to dipsy doodle around a few starboard-tack boats, not exactly the best strategy for maintaining speed. According to the Rules, it was also the correct thing to do: when two boats are on the same tack, the downwind vessel has right of way. 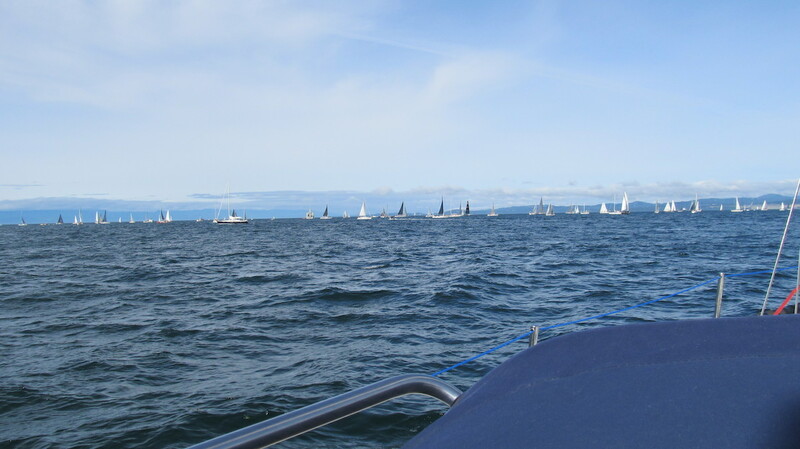 Considering the number of yachts involved in the Swiftsure and how close they pass on intersecting courses, often within a half-boat length, it wasn’t surprising to hear from an official that two had collided near the start line. Tacking, gybing, and fine-tuning sails require more than 30 minutes of practice in order to perform effectively. Admittedly, our teamwork got better as the race went on, but some practice time on the water prior to the race would have been helpful. This was especially evident at the beginning of our downwind leg when we discussed whether to fly the spinnaker. Our ground speed was 10 knots, the fastest thus far, partly due to the flood current. We couldn’t decide if the spinnaker would improve on that. The fact that two other boats, one in front and one behind, had fouled their spinnakers added to the uncertainty. So we continued on a broad reach with the main and jib for another 15 minutes until we noticed that the boat in front of us had cleared their chute and started to pull away. Paul, having the most experience with spinnakers, had ours flying in short order. We were now making 11 knots so the choice was a good one. As we got close to Discovery Island, the downwind mark, we noticed a large cluster of boats all flying spinnakers a mile or so ahead. We couldn’t figure out why they were continuing so far on the downwind leg when our chart showed safe water closer to the island. So we altered course to a run, sailing wing on wing briefly until an accidental jibe actually put us on a better heading. We continued at a good clip, got the spinnaker down without too much mayhem, and headed for the finish line. Four hours after our start, we were sitting in the cockpit with well-earned libations, discussing things we did well and other things not so well. Taking the shortcut at Discovery Island was definitely a smart move. If only we had gotten a better start, not made unnecessary tacks, and deployed our spinnaker sooner, we might have done better, maybe even came in first. No worries, at the moment we all felt like winners!